Imposition Schemes can be created and used with your eDocBuilder templates to produce imposed production files for your orders. Imposition schemes are defined in this window, and then referenced on the templates that will use them. You can define multiple imposition schemes for your account, and manage them from this area of eDocBuilder. This listing will be empty on a new account, any imposition schemes must be created for your templates using the Create New Scheme button. Once imposition schemes have been added to your account, they will show on this listing when you select the Imposition tab at the top of the window. The image below shows two imposition schemes setup in an account. When you create and edit a new imposition scheme, the options for that imposition scheme can be chosen on the window. There's no difference; all spots are the same. Start at bottom right, then counter clockwise. Start at bottom left, then counter clockwise. This option also offers an additional checkbox for "Cut/Stack through batches", which will cause eDocBuilder to to generate batches that can be cut and stacked as a unit. 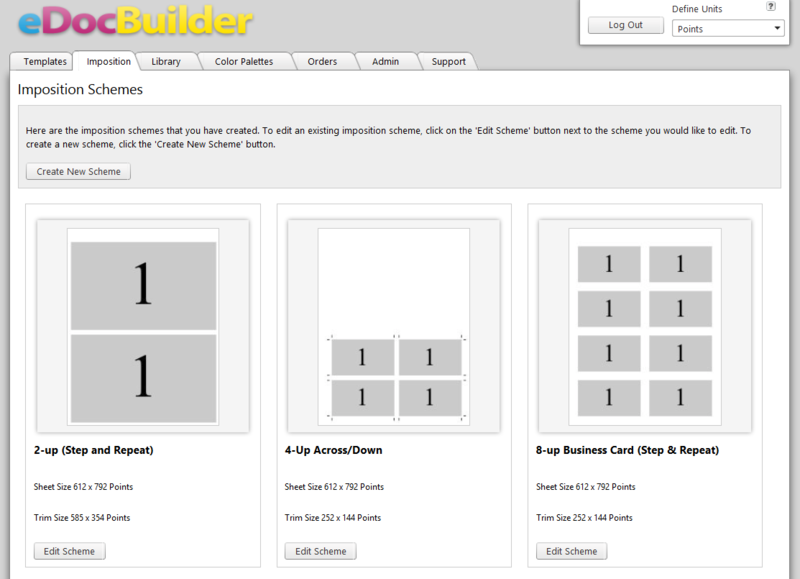 The image below shows the settings for an 8-up business card imposition scheme. The name is simply a label that identifies the imposition scheme. The preview can be downloaded as a PDF file for checking the imposition layout more closely, by clicking the View PDF link below the preview. Settings for the imposition scheme are listed and described below. The units of measurement that are used in the imposition schemes can be set from the upper-right of the window using the Define Measurements setting, which allows a selection of: Points, Inches, Feet, Microns, Millimeters, Centimeters, or Meters. This defines the units of measure in the eDocBuilder account. All measurements of page sizes, field sizes, imposition widths and heights are expressed in this unit. Only font size remains in points no matter what is selected for the measurement units. Scheme Name The title of the imposition scheme, displayed in the imposition list screen. Output Width The press sheet width from the left to right edge of sheet. Output Height The press sheet width from the lead edge (or gripper) to the trail edge of sheet. Trim Width The width of the finished product, from trim to trim. Trim Height The height of the finished product, from trim to trim. Bleed Width The width of the product, including bleed image. Bleed Height The height of the product, including bleed image. Left Margin The left margin dimension, from edge of sheet to the left-most trim line. Bleed image is included within this dimension. Bottom Margin The bottom margin of the sheet, from edge to trim. This area may be defined as the press gripper margin, and will include bleed image area. Gutter Width The inside margin between two products, left to right, including the image bleed. Gutter Height The inside margin between two products, top to bottom, including the image bleed. n-Up X Number of ups, stepped left to right. n-Up Y Number of ups, stepped front to back. Include Crops Displays crop marks in the imposition scheme. Duplex Duplex checkbox creates a backup imposition. Copy Info Allows for selecting an existing template and detecting settings from that template. You can base the Imposition you are creating off the Trim and Bleed width and height from the selected template. Overlay File The overlay file is only used if you need additional information and/or markings on the imposed sheet. 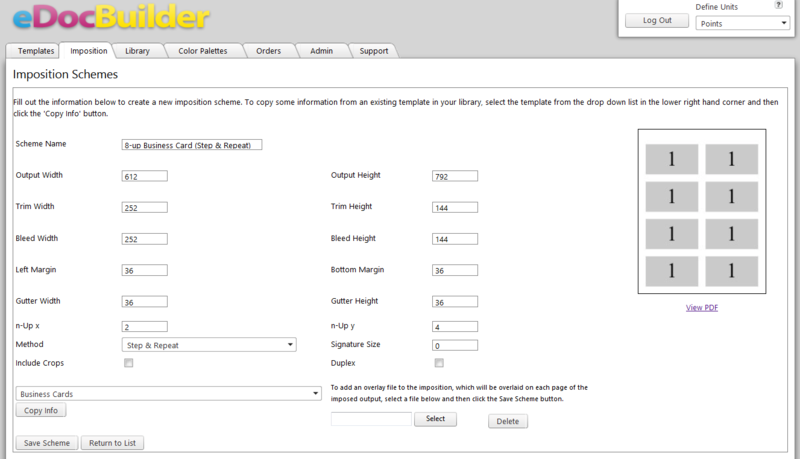 You can upload a PDF that has specific markings you need that will be overlaid on each page of the imposed output. This section lists each template this imposition is associated with. Click the red "X" to remove this imposition from the listed template. To associate with a new template click the plus "+" icon next to "Associate new template with this imposition". The page will refresh and you will now see the Associate and Cancel buttons as well as a drop down list of templates. Select a template then click Associate. Be sure to click Save Scheme after making any changes to the imposition. Return to List will return you to the main page of the Imposition tab. Gutter Width & Height is the distance between the trims, not the bleeds. For chop cuts, set the gutter width or height to zero. The correct bleeds will automatically be suppressed. To automatically fill in information based on an existing template, enter the output width & height, select the template from the drop down box, and click the 'Copy Info' button. For Saddle Stitch books, set the Signature Size to 0 to automatically include all pages in the book. Step & Repeat - Use this method to produce a full sheet (with one or many copies) for each record in your document. Step & Repeat and Saddle Stitch are the only methods that will function correctly with templates that do not use a variable data upload. Saddle Stitch - Use this method for documents that will be bound together with a saddle stitch (such as a booklet). This method requires a single document of many pages in order to function correctly. Cut and Stack - This method will only function correctly with templates that use a variable data upload. When selected, it gives you the option of checking an additional checkbox called "Cut/Stack through batches". If this additional checkbox is selected, the imposition will generate batches so that when placed on top of each other they can be cut and stacked as a unit. The “View imposition preview” button will also download a ZIP of four small PDFs. Die cut - This is a hybrid of the Cut and Stack and Down/Across methods. This method will only function correctly with templates that use a variable data upload. Across/Down - This method will only function correctly with templates that use a variable data upload. Down/Across - This method will only function correctly with templates that use a variable data upload.